Book 2 in the welcome to Carson series but can be read as a standalone. Nikki and Austin are the Hero’s of this story. The story line flows beautifully and keeps you engrossed throughout, the twists and surprises hidden along the way will leave you speechless, have your heart pounding and closing off the outside world as you delve deeper into Austin and Nikki. Their journey is not a quiet and simple one, Austin is fiercely loyal, and loves hard. Nikki returning to Carson, unsure about what is to come but knowing she has to take a chance on her heart and Austin. Renee’s writing makes reading this effortless, if you have read book one you learn more about the main characters alongside Nikki and Austin, yet it has been written so it can be read as a standalone. A thoroughly enjoyable read and excited to read the next book. Austin thought he and Nikki had something special, but when she returns suddenly announcing her pregnancy, he can’t control his hurt and anger, but the pull and attraction become too much for him to ignore and he finds himself in her arms once again. He’s thrust back into the emotions he’s held onto since Nikki left him. Nikki Deveraux never had it easy growing up. As a part of a wealthy family where her parents cared more about their bank account and affairs than they did about their only daughter. Taking a chance on her heart, Nikki works to rebuild her relationship with Austin after running away scared and when she uncovers someone stealing money from his company she fears he’ll give up on his dream of happiness yet again. 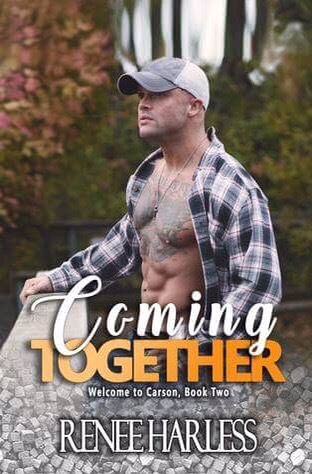 Coming Together (Welcome to Carson, Book 2) is LIVE and FREE in Kindle Unlimited!